What does it take for people to move past fear into action? I certainly wasn’t the only person thinking about this question during the recent federal government partial shutdown. More than 400,000 federal workers were ordered to work, but weren’t being paid. For many of us, it seemed absurd that someone would choose, day after day, to go to work with no paycheck in sight. And yet they did. If they simply stopped going to work, they could instigate a political crisis and force an end to the shutdown. What began as a call on the political left for government workers to break the political stalemate with a sick-out had, by around Day 30, become a loud chorus for collective worker action from a broad spectrum, including politicians normally quite hostile to working people. But fear is a powerful force in vast swaths of the federal government. In the Transportation Security Administration, management has imposed a profound culture of fear on airport screening officers through mass firings and harassment, brutal intimidation, overwork, and extended probationary periods. As one screener described it to me, to go to work for TSA is to enter a battlefield of psychological warfare. For the first weeks of the shutdown, that culture of fear kept most workers from acting. But then screener sickout rates ticked up ever-so-slightly, and on the 35th day, enough air traffic controlled stopped working that LaGuardia and other major airports had to delay flights. Within hours, Trump caved and the politicians ended the shutdown. On that 35th day, enough workers reached a psychological tipping point, where their sense of hope and urgency finally outweighed their fear. They acted, and the intractable political ice dam shattered. What’s required to conquer fear, shift power, and ultimately build social movements is the hope of raised expectations, the belief that we deserve better, paired with urgency, the belief that we need to act because things will only worsen if we stay put. It’s not enough to recognize that things are bad. The pain of the known can be more bearable than the frightening prospect of stepping into the unknown. Stories can be powerful instruments to move people from inertia to action. Or, they can hold people back. For the first few weeks of the shutdown, many federal workers, asked about why they didn’t simply walk off the job, raised the specter of the PATCO strike, the calamitous 1981 walkout that cost 11,000 air traffic controllers their jobs and broke their union. For workers in 2019, PATCO was their guiding story. It took time to erase that and replace it with another narrative before enough of them were ready to act. The Exodus story – a story of slave revolt, the original general strike – served as a fitting parable during the first successful $15 minimum wage ballot initiative in the US. I was campaign director of the historic SeaTac Airport organizing campaign, in which immigrant airport workers and community members challenged corporate power, organized, and claimed a ballot victory that lifted thousands out of abject poverty. The SeaTac movement drew together workers and community members from Somalia, Ethiopia, Ukraine, the Philippines, Mexico, India, Iran, Russia, and Eritrea whose shared culture was the constant scramble to pay $1,500 monthly apartment rents on minimum-wage paychecks. Language barriers were enormous. The Exodus story provided a common framework for white mainline Protestants, Orthodox Christians, Catholics, Muslims, and this Jewish organizer. The tale of a people fleeing slavery to freedom, a story shared by the three Abrahamic faiths, helped us traverse language and cultural boundaries, overcome employer threats and retaliation, and fuse the diverse movement into a force capable of disrupting the status quo. We knew, through the story, that we had to take big risks in confronting our modern-day corporate Pharaohs, and we would only succeed if we crossed the Red Sea together. We also recognized the personal and collective cost of inertia. My SeaTac colleagues grew emboldened by recalling other scriptural stories as well. Mohamed Sheikh Hassan, a leader in Seattle’s Masjid al-Karim and a key activist in the campaign, recalled that the Battle of Badr, where Muhammad and his ragtag band overcame an army ten times their size, served as an instructive lesson for Muslim SeaTac workers. “The Prophet understood that ‘Yes, they are more than us, but we are on the right track. If what we have is true faith, then we will overcome,’” he said. Stories can guide us in specific situations, as well. Rev. 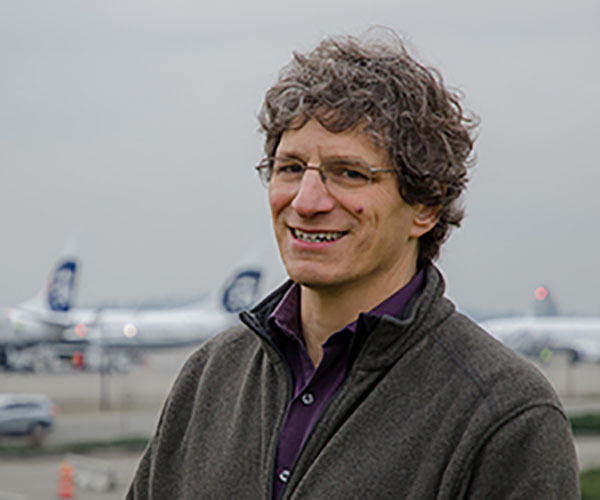 John Helmiere, convening minister of Seattle’s Valley and Mountain Fellowship and another key leader in the SeaTac campaign, recalled heading up a delegation of dozens of airport workers, clergy, and activists to the headquarters of Alaska Airlines, the dominant company at SeaTac. The group intended to present a demand for union recognition to the airline’s CEO. A manager came to the door and announced – no surprise – that the CEO was unavailable. But, he continued, Alaska’s director of public relations was eager to talk with a small number of clergy – inside, apart from the crowd. Did a delegation want to come in? Stories advance social movements by teaching people that it’s possible to fight against enormous odds and win. Stories are all the more powerful when people embrace them as their own; a recognition that we’ve been here before, maybe not personally, but that we, as a people, have been here before, and so the story becomes ours, too. A few years ago I was talking with a young leader in the Seattle local of the International Longshore and Warehouse Union (ILWU). He described to me how the union hiring hall was won “in 1934, when we struck the west coast.” My first thought was, “Your parents might not have been born in 1934, much less you.” But then I realized that the union brother had been quite intentional in his first-person language: Though he wasn’t physically on the picket lines 85 years ago, other union members were there, representing not just themselves but future generations of longshore workers. He was figuratively there too. That made it part of his own history and the collective consciousness of today’s ILWU members. Moreover, the Passover liturgy commands us to tell the story of enslavement and freedom to others, especially younger generations, lest the story disappear into the ether of history. And now we have a new story we must tell: A story about how federal workers finally decided they had had enough, took action, and decisively broke the Trump shutdown. It may not have been as visible as a mass slave revolt, but it’s a vital story for our times. And if we tell it, and keep telling it, then somewhere down the road it is sure to inspire people locked in a difficult struggle to move past fear and into action. What experiences have you had, either individually or part of a group, in the navigating tipping point between inertia and action? As you’ve engaged in social justice work and discourse, at whatever level, what obstacles have you encountered? What stories have you drawn on to overcome those obstacles? Jonathan Rosenblum is a community organizer for Seattle City Councilmember Kshama Sawant and a leader in Kadima Jewish Community. He is the author of Beyond $15: Immigrant Workers, Faith Activists and the Revival of the Labor Movement (Beacon Press, 2017) and is a member of UAW 1981/National Writers Union. Jonathan was campaign director for the SeaTac Airport workers’ Fight for $15 campaign.